Yes, we know Peter hit his head. He seems to have recovered quickly compared to most previous incidents (including the bit during the Dara Dorset storyline, where he spent a week being woozy). The image of the Vulture carrying off Jonah Jameson is pretty funny, though. I like that. So I have this other Blog called Third Attempt, see? It's a new version, dealing with various other bits of entertainment, like full-fledged comic books. So I was going through my comics to review, and I found one. It was a Spider-Man comic, of course, and when I cracked it open and looked at the credits, whose name should be looking up at me? 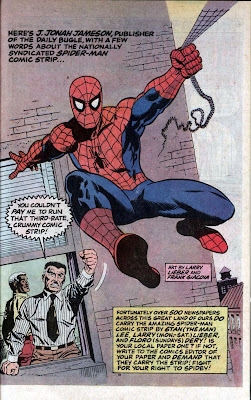 Larry Lieber is the gentleman who is supposed to be drawing the Amazing Spider-Man comic strip right now, so you may or may not be interested in seeing a little bit of his comic book work from the mid-eighties. Jameson being carried off by the Vulture, high above the streets of New York, with the unstated promise that the Vulture plans to drop Jameson to the pavement at any moment: Fun, new, and somewhat exciting. Peter Parker being hit in the head by debris: Same old nonsense. Honestly, we all knew that Peter was going to get hit in the head at some point during this storyline. Ah, and chances are Maria Lopez is going to save Jameson with her news 'copter. ...well, I wasn't expecting that. Touche, Stan Lee. Touche. Also, in the third panel, it looks like Peter is about to snap Mary Jane's neck. This is getting pretty monotonous, but that little blurb in panel two sort of promises some sort of resolution to the whole thing pretty soon. Unfortunately, tomorrow will probably have Maria Lopez boarding her helicopter, for the folks who don't get Sunday Spider-Man. Perhaps by Tuesday Peter will be off going to be Spider-Man. This is a post so that you, the reader, can give me constructive criticism and whatnot. He could have also said that, since the battle would most likely be fast-paced and filled with movement, then a room with windows only on one side of it would not be the best place to take pictures of it. Since that's true. After all, I'm sure that the Vulture wouldn't be considerate enough to keep the battle in view of that window. Besides, won't Peter be getting glare in every picture since he's taking them through glass? I do like how Jameson is getting violent against Peter. That's pretty fun. I hope it continues. I'm still confused about that solid gold filing cabinet, by the way, but am beginning to hope it's in every strip from now on. I don't care who's saying something in the second panel, but none of them should be excited about the freaking Vulture. One is Spider-Man, for god's sake, and the other two regularly interact with Spider-Man and his rogues. Besides, they knew the Vulture was coming. In any case, Peter will most likely cut out to "get a better shot" pretty soon, and then he'll fight Spider-Man. If we're bizarro-lucky, we'll get two weeks of Peter attempting to get out of there so he can fight the Vulture. I'm hoping this is not the case. So the Chrysler Building is in Midtown? Wonderful. Also, is it really a scoop if everyone in the city knows what's going down already? No, it's not. Hopefully tomorrow's post will go up in a more timely manner. Watch as Mary Jane clings to her husband, refusing to let him go for even a moment. She has the power to cling to those who cling to walls. Today is basically a recap of the previous week of strips. What sort of nonsense is that? The bad sort, that's what kind! Ah, and unless Jameson is being sarcastic, he is putting way too much stock in Peter's photos here. My goodness. My only knowledge of New York's neighborhoods and whatnot is based on the "Spider-Man 2" video game. I know that these different neighborhoods exist, but not where they exist (other than New York). As such, Jameson wanting Peter to meet him in Midtown at noon to take pictures of a showdown atop the Chrysler Building, also at noon, might be a doable endeavor. I have no idea if it is or not, though. I'm sure we're supposed to be feeling a sense of triumph over Peter's return, but I'm not feeling it. I feel only ennui. The Vulture has obviously put up several messages. I do not know why the Vulture has done this, but presumably he's putting them up all over the city. Some only tell Spider-Man to meet the Vulture at noon, while some (such as the above message) tell him where to meet. Spider-Man, and everyone else in the city. Good going, Vulture. You two won't be able to move with all the media and police around. Ah, and while the Vulture may be a good speller, he's not that good at grammar. Unless he's going for a telegraph thing. Oh, and I pose the question again: what is the Vulture using to write these messages? My hopes to see him flying around in a biplane remain afloat until this is revealed. I'd like to think that the Vulture is saying "That's it!" in regards to Maria's terrible pun. I have no idea what the heck a man who can fly would want from a local airfield. Unless it's some sort of gun. It's probably some sort of gun, isn't it? Perhaps this will degrade (upgrade?) into an epic media war between Jameson and Lopez over who gets to hate on Spider-Man. So I was reading some Spider-Man comics earlier, and one had the Vulture in it. The Adrian Toomes Vulture, though. The good Vulture. It was mainly a cameo, but do you know what he was doing? Holding up some sort of roof-top restaurant with a gun. Of course, in the comic, the Human Torch showed up and showed the Vulture a thing or two (it was from the Spider-Man/Human Torch mini-series) by burning off his wings, and boy was Spider-Man embarrassed. This was really jut a roundabout way of filling up a post about a strip which is going in circles. I can only assume that, since Maria has taken up the role of Spider-bashing, then Jonah is going to come up with a talk show and beg for Spider-Man to be on it. At some point, Spider-Man will fight the Vulture inconclusively, then appear on Jameson's talk show. Then he'll come home and collapse. While Spider-Man is bed-ridden again, Mary Jane will force him to stay in bed forever and ever until he's feeling better and the Vulture will pull off another low-level crime. I think Stan Lee has gotten sick of the strip, and is just going to keep on going in this loop for years and years. I'll keep this Blog going, though, but expect me to eventually start calling it in and putting up blog posts which are so generic and unmemorable that you'll eventually stop reading this. Stay tuned, folks! A man with wings can't not look stupid. That's one thing. Swim, maybe? Not sure about that one. Carry more than one measly bag of money, apparently. Well, folks, anything else a man with wings can't do? Ladies and gentlemen, I give you today's strip: When I saw this, I was appalled. Why, you ask? Simply because the exact same thing happened in "Amazing Spider-Man" #2: For shame, Stan Lee! For shame! I have to admit that I do like the moneybags, though. Shoot him with a sniper rifle while he's menacing a group of elderly rich people atop a building. Seriously, not that hard. Once again, no promise was made. Mary Jane is being pretty smart here, though, as Spider-Man would probably get killed if he tackled the Vulture in his condition. I do like the term "Human Buzzard" for him, though. You could probably get a whole other villain from that. Mary Jane gives the recovering Peter a seizure in panel three. Good going, Mary Jane. Spider-Man has made no promises to capture anyone tomorrow. He just said it wouldn't happen tonight. People are jumping to conclusions all over the place with this. Also, Mary Jane's line would have made more sense if she had said Vulture instead of flu, because there's really no sign that the flu is anything other than a minor annoyance for him at this point. 1) Spider-Man admits he's just going to go home and sleep after the show. 3) The Vulture also realizes this, and further realizes that if Spider-Man is too tired to fight crime, then he is easy pickings. Spider-Man just totally screwed himself over, folks. This strip is beginning to make embarrassingly bad flu-based puns, and I really hope they stop. Seriously.